Last night at The Muny, on a beautiful summer evening in St. Louis, the audience experienced pure, theatrical joy. Those lucky enough to be in attendance for the opening night of Singin’ in the Rain are able to say that they were there when it happened. That is, when a life-long dream became a reality for 29-year-old Corbin Bleu. The actor has starred in Broadway shows like In the Heights, Godspell, and Holiday Inn. But when he was only five or six years old, he performed his first dance number to “Singin’ in the Rain.” And last night, Bleu took to the grand stage of The Muny as Don Lockwood – and a star was solidified. Singin’ in the Rain premiered as a film in March of 1952, written by Betty Comden and Adolph Green, with songs by Nacio Herb Brown and Arthur Freed. The film, of course, starred Gene Kelly (who also co-directed and choreographed), Debbie Reynolds, and Donald O’Connor. AFI ranks it as number five on their list of 100 Greatest Films, and the film grossed five times its budget – proving to be a huge success for MGM. The first stage-adaption took place just over a year later, staying very true to the beloved film. 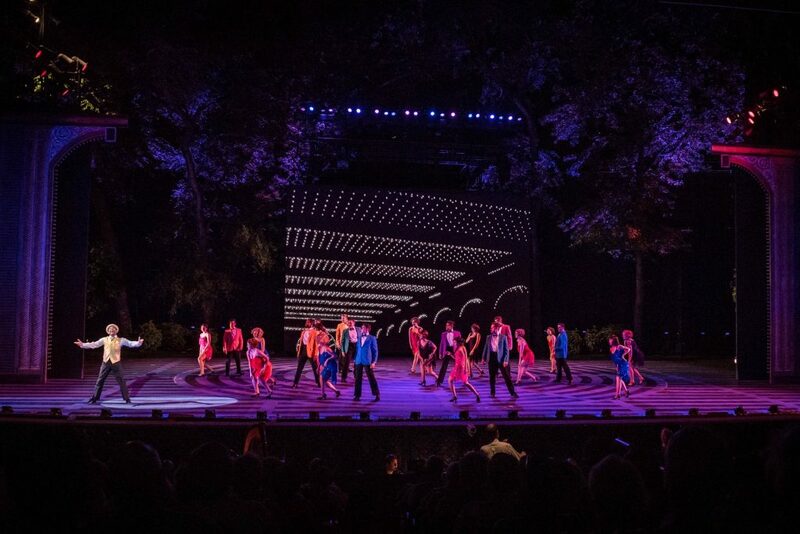 The Muny has enjoyed productions in ’86, ’95, 2000, ’05, ’11 – and now, once again, in 2018. And what a delight this latest version is. Don Lockwood (Corbin Bleu) is the definition of rags to riches, rising through vaudeville to become the biggest movie star at Monumental Pictures. His friend Cosmo (Jeffrey Schecter) has always been by his side, and as of late – unfortunately for Don – is Lina Lamont (Megan Sikora). Audiences love “Lockwood and Lamont,” but the leading man would love nothing more than to ditch his counterpart. Enter Kathy Selden (Berklea Going), an aspiring actor who barely gives Don the time of day. After an unfortunate misunderstanding at a Hollywood party, thrown by studio head R.F. Simpson (Jeff McCarthy), the two eventually become close – and together navigate the new world of talking pictures. Read our interview with Corbin Bleu. To say that the cast of Singin’ in the Rain is extraordinary almost seems like an understatement. I was blown away by everyone involved, who clearly put their hearts and souls into every number. And the near-instant standing ovation would support my claims. Bleu was able to do the impossible, which was to channel whatever was the infinite joy machine that Gene Kelly had at his disposal. The actor’s natural charm and charisma leap off the stage, always wearing a smile as he gives it his all. For him, this role was decades in the making – and Corbin Bleu was more than prepared when he took the stage on Wednesday evening. Long days, full of rigorous rehearsals, truly paid off. And as someone who considers Singin’ in the Rain to be one of the greatest films of all time – I was blown away by his performance. The delightful Berklea Going was terrifically cast as Kathy Selden. Like her other two co-stars, the actor had big shoes to fill – in the case of the movie, Debbie Reynolds. Yet she had no trouble playing the strong-willed, fully capable Selden. Her chemistry is great with Bleu, as we watch their differences slowly transform into a budding relationship. Going has a beautiful singing voice, which is perfect as her character is chosen to dub the voice of Lina. The third of the amigos in our principal cast is Jeffrey Schecter as Cosmo Brown. 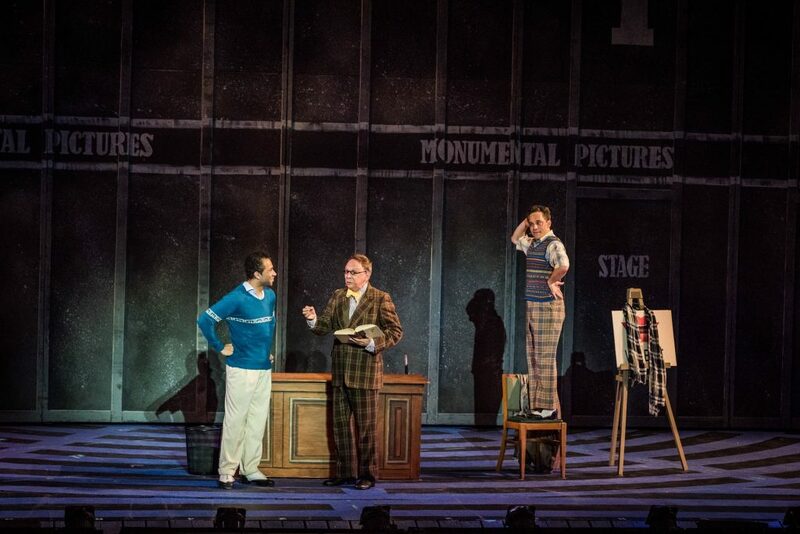 The physical comedy is so important for the character, and Schecter has impeccable timing – as evidenced by his rendition of “Make ‘Em Laugh.” He and Bleu play well off one another throughout the show, most notably during their “Moses Supposes” number. The two are well-versed in tap, and perform several fantastic duets. And all throughout the performance, the actor had the crowd laughing – just as Cosmo would hope for. All three of the leads – Bleu, Going, and Schecter – are fantastic on-stage with one another. There was an undeniable chemistry in the film between their characters, and this show manages to capture it gloriously. Megan Sikora is hilarious as silent film prima donna Lina Lamont. Her character is so much fun to root against, as she constantly creates more and more reasons to. Sikora pays tribute to the film’s star, Jean Hagen, while still making it her own. The role is expanded here, as she gets a show-stopping number with “What’s Wrong With Me.” Sikora had the audience roaring with laughter and applause, which was all well-earned. Singin’ in the Rain is packed full of unforgettable numbers, and doesn’t hesitate to wow the audience right out of the gate. 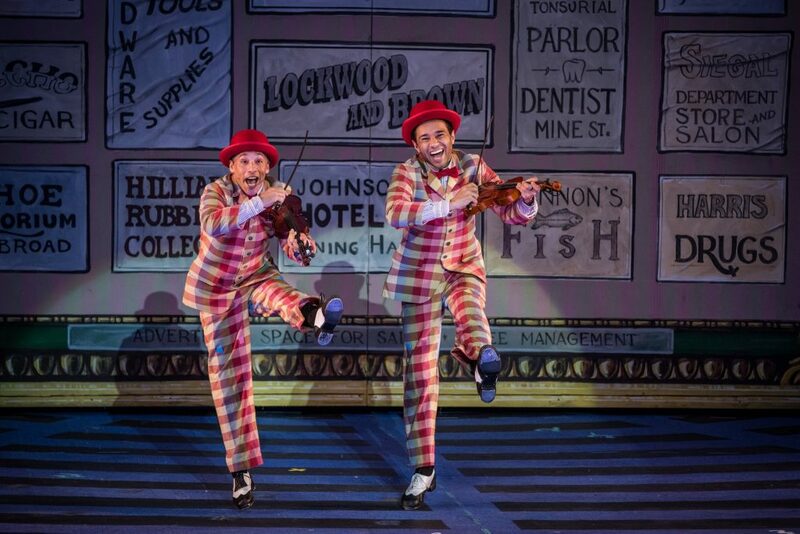 The first number, “Fit As a Fiddle,” sees Don and Cosmo recounting their vaudeville days through a meticulously crafted song and dance routine. This is just a taste of the brilliant choreography by Rommy Sandhu, who did a fantastic job of reimagining the original film’s dances for the stage. Bleu and Schecter are amazing in this jaw-dropping number, juggling their violins while singing and dancing with comedic precision. The show sets the bar incredibly high with this number, and manages to keep the same amount of energy throughout. 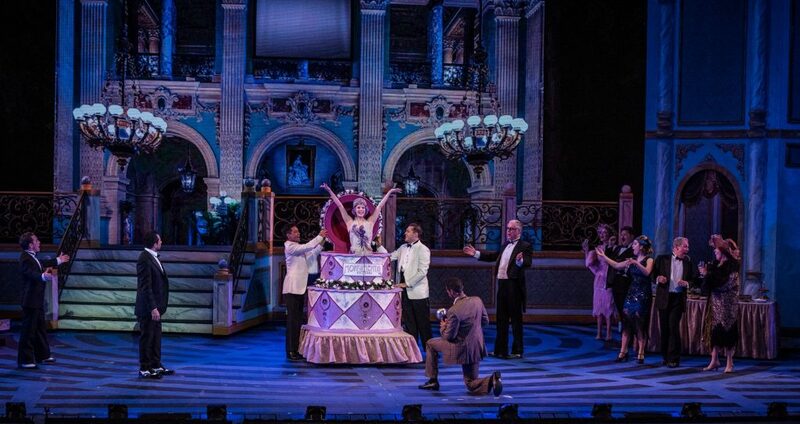 As soon as the iconic music for the title number started playing, Bleu was welcomed by thunderous applause. The stunning scenic design, created by Paul Tate dePoo III, provides an artificial rainstorm for the joyous dance. 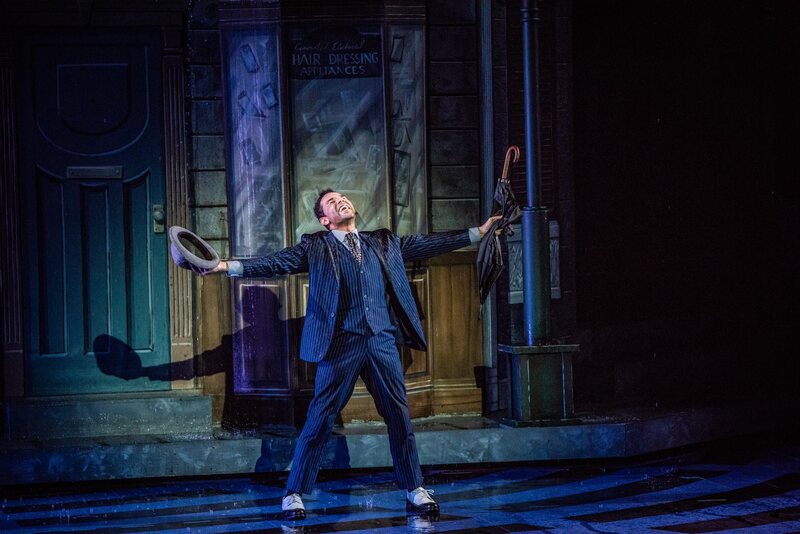 It is pure delight watching the actor singing and dancing in the rain, splashing through puddles and becoming drenched – all with a smile on his face. It’s impossible not to smile yourself, as is the case for pretty much the entire show. There’s also a great encore of “Singin’ in the Rain” at the end of the show, featuring the entire cast in matching raincoats with colorful umbrellas. It’s a delightful surprise, and a great way to end the evening. Greg Emetaz’s video backgrounds are fantastically put to use in the production. There are several short films that were created just for this show, to simulate the evolution of silent film into talkies. These segments were cleverly crafted, and quite funny. The way the backgrounds integrated these shorts as if they were being projected was great. 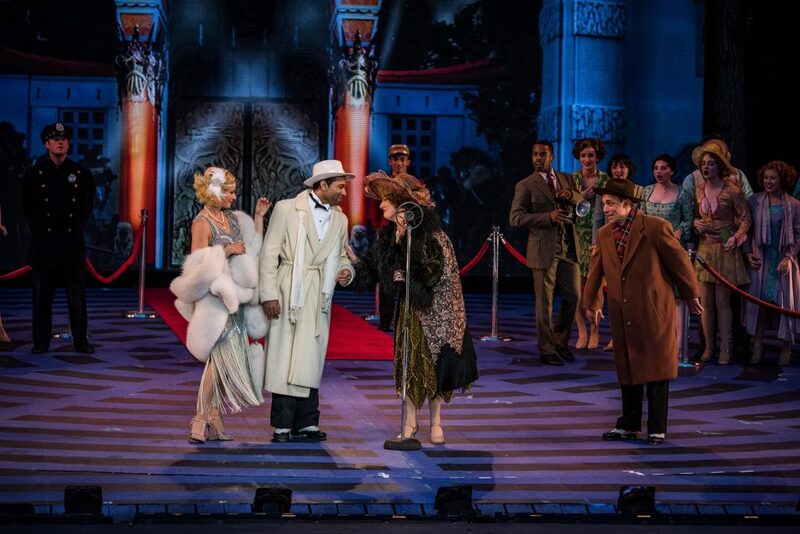 The backgrounds also transport the audience to Grauman’s Chinese Theatre, Broadway, and all over Hollywood. The lasting music of Lennie Hayton’s score, and the unforgettable songs composed by Nacio Herb Brown, are wonderfully recreated by the orchestra under the direction of Ben Whiteley. There is so much to take in during the show, and most of the numbers feel big in the best way. It’s a non-stop flow of endorphins for the audience, as each scene seamlessly flows into the next. Director Marc Bruni ensures that fans of Singin’ in the Rain, who have enjoyed the classic film and timeless songs for decades, will be wearing a smile for two-and-a-half magical hours of theatre. The entire cast and ensemble are magnificent from start to finish. They all move as one during the intricate dance numbers, and appear to do so effortlessly. Corbin Bleu was born to play Don Lockwood, and it is easy to see that he is loving every single moment of it. The actor is a star – a true showman in the greatest sense of the word. Tireless rehearsals ensured that every move looked flawless. But the type of energy and joy that Bleu brings to the stage is something that can’t be taught. I can’t wait to see where the young actor’s career continues to take him. 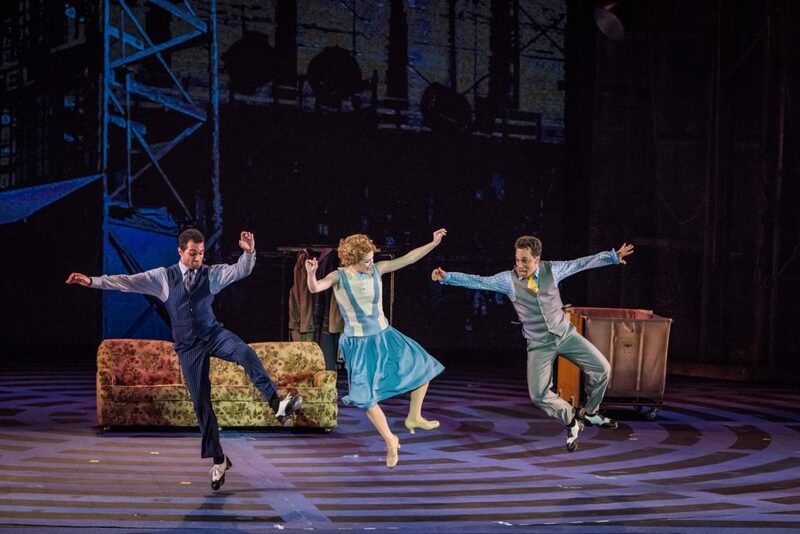 I can think of no better feel-good show than Singin’ in the Rain, and The Muny’s production is simply perfection. What a glorious feeling! 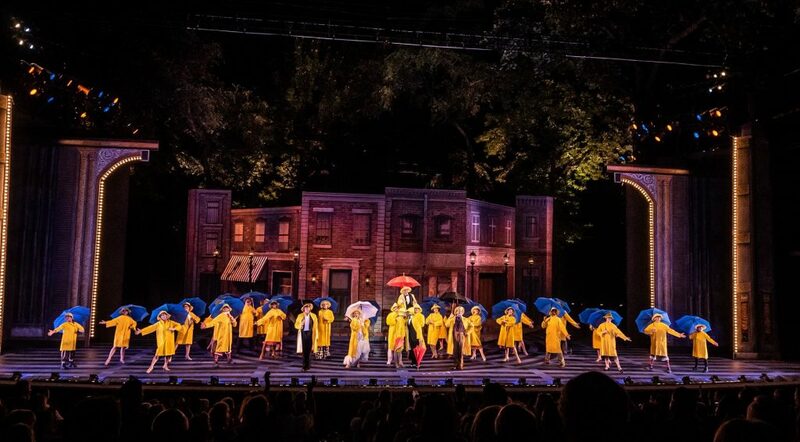 The Muny’s production of Singin’ in the Rain runs through July 3! Tickets range from $15-$100, and are available through MetroTix. For more information, visit Muny.org.